The Dominican Republic is found on the island of Hispaniola. The south coast is bordered by the Caribbean Sea, and the north coast lies on the Atlantic. The capital city, Santo Domingo, is in the south. The climate of the Dominican Republic is tropical. This means the temperature fluctuations across the year are low. The average temperature is 25 degrees Celsius. However, there are regional differences between the south, the north, and the higher elevations. Since the southern side of the country is located on the Caribbean Sea, it is hotter and drier here than in the north. The temperatures in the north are similar to those in the south, but it is slightly cooler in winter. Furthermore, there is a higher humidity in the north, and therefore more humid weather, as the south lies in the rain shadow of the mountain range Cordellia Central. In the higher altitudes, such as in the city of Constanza, the average temperatures are below those in the south and north, at about 18 degrees. At night, it can cool to below 10 degrees. Because of the tropical climate, there is a rainy season and a dry season in the Dominican Republic. The respective times differ depending on the region. In addition, the Dominican Republic is located in the catchment area of tropical cyclones, or hurricanes. In the following climate chart you can see the weather conditions for the whole year in the capital, Santo Domingo, on the Caribbean Sea. Similar values apply to the region on the Atlantic. From the weather data, you can find that the best time to visit the Dominican Republic is the months from December to April. In this time you can expect the best weather conditions for a fantastic beach holiday. In the Irish winter time, the Dominican Republic is the perfect destination to escape the cold temperatures. December: 30°C, 6h sunshine, 27°C water temp., 8 rainy days, 79% humidity. January: 28°C, 6h sunshine, 27°C water temp., 7 rainy days, 78% humidity. February: 29°C, 6h sunshine, 26°C water temp., 6 rainy days, 73% humidity. March: 29°C, 7h sunshine, 26°C water temp., 6 rainy days, 75% humidity. April: 30°C, 7h sunshine, 27°C water temp., 7 rainy days, 76% humidity. 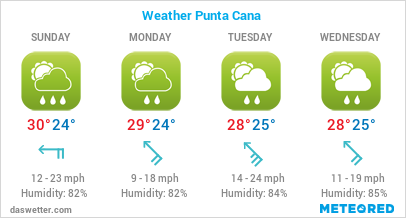 Throughout the year, midsummer temperatures prevail in the Dominican Republic. The time from December to April is especially popular, as the weather is at its best during these months. With this optimal travel time, you need to keep in mind that many other tourists will also decide to go on holiday. This brings with it increased flight and hotel prices, as well as full beaches. But in the other months, tropical temperatures prevail in the Dominican Republic, and a break still pays off. However, it may then come that you are affected by more rain showers. If you travel to the Dominican Republic outside of the best time for weather, then remember the rainy season may be occurring in some regions. It shouldn’t spoil your holiday. During the rainy season, it doesn’t rain constantly, but in brief and violent spurts. The sun will shine again, the air is fresh, and the vegetation blooms. Although the humidity is higher, you should still be more than able to cope with these conditions. November is hurricane season in the Caribbean area, and therefore it’s also hurricane season in the Dominican Republic. The highest possibility of being hit by a hurricane is in September and October. Nevertheless, there are rarely tropical cyclones on the island. More often, there are heavy rains, strong winds, and storms. The most popular destinations in the Dominican Republic are Santo Domingo in the south, Punta Cana in the east and Puerto Plata in the north. You will learn now when the best time is to visit each of these places. The capital city, Santo Domingo, lies on the southern part of the island on the Caribbean Sea. As mentioned above, the south of the country is drier and hotter overall. This is especially true for the months of December to May. For this reason, these months are the best time to visit Santo Domingo in the Dominican Republic. The average temperatures during the year are around 30 degrees Celsius. The conditions are perfect for swimming in the sea, with an average water temperature of 27 degrees Celsius. The humidity is quite high, at an average of 75%, but still less than in the other months. In the rainy season it is much higher. In the south, the rainy season is the months of May to November. 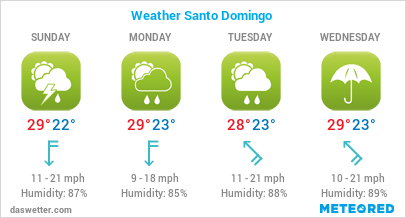 This time is generally not recommended for travel to Santo Domingo. The temperatures reach their maximum, the humidity is extreme, and there is a danger of tropical cyclones. If you can take these conditions, you’ll experience a great beach holiday in the rainy season. Punta Cana is the island’s premier tourist destination. The place is located on the east coast and the climate is similar to the south. The temperatures are tropical throughout the year, and the water is always wonderfully warm. Temperatures are on average between 28 and 31 degrees Celsius. At night during the summer months the temperatures can be up to 24 degrees. Since the months of December to April are driest, and have the fewest rainy days, they are considered the best time to visit Punta Cana. In the months of May to October it rains more frequently, the humidity is extremely high, and temperatures are hot. The rainy season also characterises the hurricane season in the Caribbean. Puerto Plata is located on the north coast of the Dominican Republic. The climate, and thus the best time to visit Puerto Plata, is influenced by the Cordillera Central mountain chain. Due to rising trade winds, which cool off at higher altitudes, it rains more often in the north than in the south. Temperatures in the north are slightly cooler than in the south, but it is still warm and tropical all year around. 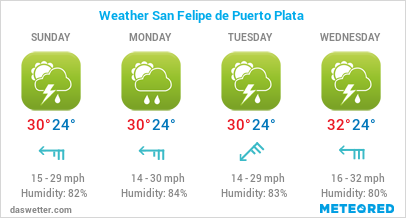 On average, temperatures of 30 degrees Celsius prevail in Puerto Plata. In the months of December to March, the temperatures are just below this. It’s not as hot in this time as it is in the other months, and the number of rainy days is higher. The rainy season prevails in the north from November to January. On average, there are 12 rainy days during these months. The least rainy days fall in February, March and April. This makes these months the best time to travel to Puerto Plata, and generally the best time to visit the Dominican Republic. Anyone who loves a tropical climate year round will really feel at home in the Dominican Republic. The temperatures fluctuate around 30 degrees during the day. Sometimes they are lower, and sometimes higher. The same applies to the temperatures of the Caribbean Sea and the Atlantic. Due to the rainy season in most regions during the summer months, December, January, February, March, and April are considered the best time to visit the Dominican Republic. In the north, the optimal time to visit is shortened by a few months to February to April. If you have no problem with short and heavy rain showers while on holiday, the months of the rainy season are suitable for travelling to the Dominican Republic. Book your holiday in the rainy season, but do be forewarned about the risk of hurricanes. Fancy sun, sand and sea? Find all my Dominican Republic deals here!